The character 田（ㄊㄧㄢˊ） means field or farmland. Here is the stroke order animation and pronunciation. Here are the individual strokes for writing the character. Here is the definition in Taiwanese Mandarin. Here is the evolution of 田. Really good one for us in schools. 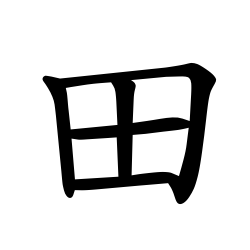 This symbol means pen or pencil 筆. The character 筆（ㄅㄧˇ） means pen or pencil. Here is the stroke order animation and pronunciation. Here are the individual strokes for writing the character. Here is the definition in Taiwanese Mandarin. Here is the evolution of 筆. Language translation is the fourth thing done on the internet. Only 20% of respondents said that they would pay for human translation in China. They say that this is because current machine translations do not currently reach their expectation. Can we confer from this that once it is better that even these will be less inclined to rely on a human? In an ideal world a mix of both would surely be advantageous but only time will tell. The character 魚[ㄩˊ] means fish. Here is the stroke order animation and pronunciation. Here are the individual strokes for writing the character. Here is the definition in Taiwanese Mandarin. Here is the evolution of the written form of 魚. The earliest two forms were pictures of fish! Interesting video showing students from two language backgrounds learn together while instruction is systematically delivered in two languages. At Ardmore, students enrolled are from English and Mandarin speaking backgrounds. Chinese has various dialects but until I read this story I did not realise that within China there is also the language Putonghua. There are millions of children within the Yunnan Province who like the Welsh in Wales have a second language in schools. Aided by a religious group they are developing bilingual education. School is hard enough when you are a kid, but imagine if you did not even speak the language you are being taught in. That is the case for millions of children in Yunnan Province, which boasts the greatest ethnic diversity in China, containing 25 of the country’s 55 ethnic minority groups. While most kids speak their mother tongue at home, they often find themselves struggling in school, where classes are taught in Putonghua. And under onslaught from both Putonghua and globalization, the native languages of the province are in danger of disappearing. But educators and linguists are trying to change the situation by introducing bilingual education in these areas, with the help of a foreign faith-based NGO. The US-based SIL (Summer Institute of Linguistics), which works to study and document the world’s smaller languages, has been cooperating with local authorities in Yunnan to conduct bilingual education among children since 2004 in Jianchuan county, where over 90 percent of the population are Bai people. In 2010, they launched a 10-year zero barrier bilingual project in Jianchuan. A total of 71 students, from preschool to the second grade, from one primary school are involved in the project. The idea is to teach kids to read and write in their mother tongue during the two years of preschool before introducing Putonghua. SIL specialists worked with local teachers to develop the curriculum for the kids. Materials are drawn from local communities, borrowing folk stories, cultural practices in that area and other things that kids are familiar with, said Keith Slater, associate director of academic affairs at SIL East Asia. With the Bai project, SIL helped give an 18-month-training program to teachers, many of whom were not highly educated and lacked teaching experience. Teachers were also trained to give more active classes and encourage participation by the children. There are no numbers yet from long-term large scale trial projects, as the effects of such education could take years to show, which also poses challenges for the wider application of such models, said Slater. Feedback from the local partners and students is also positive. Yang Jimin, the project manager from the education bureau of Jianchuan, said the students showed significant improvement in their test results. The school used to rank at the bottom in the township, but now has moved up to the mid-level. “We also found that kids who learned their mother tongue first are much better at learning Putonghua and show much better progress in cognitive development,” said Yang. SIL has staff in seven provinces engaging in language research and publications. In 2011, it concluded a six-year Dai bilingual project in Jinghong, Yunnan, covering over 700 children in five schools. Similar projects have been also launched in Guizhou. But linguists from SIL have been coming to China since the 1980s, mainly for research. They have helped more than 20 ethnic minority groups develop their own writing systems and have published books and dictionaries, according to Slater. Many of China’s southwestern hill peoples originally had no literacy in their own language. Yale anthropologist James C. Scott theorizes in The Art of Not Being Governed that they may have given up literacy in order to avoid dominance by the State and maintain flexibility in customs and alliances. But in the modern world, studies have shown that languages without a writing system are more at risk of disappearing. Having a writing system helps the people have greater access to information and gives them the resources to use the languages for anything they want, said Slater. Many efforts have been made by Chinese scholars since the 1950s to help identify, document and preserve the minority languages. But the disappearance of these languages is still an eminent issue around the world. Study results published in 2008 by Chinese scholars recognize 129 independent languages in China, 117 of which are in danger of extinction. The UNESCO Atlas of the World’s Languages in Danger identifies 144 languages in China that are endangered to different degrees, including nine languages that are already extinct. UNESCO rates a language’s degree of endangerment primarily by looking at whether children are still learning the language as their mother tongue and the scope of use across generations. China’s policy of promoting Putonghua, a standard spoken and written language, is often blamed for putting dialects and minority languages in danger. The country started to promote Putonghua across the country in 1956, although policies for ethnic minority areas are more relaxed. Ethnic languages are allowed for use in schools, broadcast media and government agencies. But still, children mostly need to start Putonghua lessons in school, and they certainly need Putonghua to go to college. A lack of resources, such as teachers and tailored learning materials, limits the promotion of minority language projects. Yang complained about the lack of funding to recruit and train teachers, especially for the preschool children. Ai Bian, a researcher from the local education bureau who oversees the Dai bilingual project in Jinghong, told the Global Times that some schools don’t have ethnic teachers despite having a majority of ethnic students. He recalled that a preschool Han teacher had to ask the only child in the class who could speak Putonghua to translate for him. For kids at higher grades, there also lacks materials in their mother tongues, which means the reach and long-term effect of the projects are limited. Ai said that over 70 percent of ethnic minority kids drop out of middle school to go back to attend their family farms. “They have a poor grasp of their mother tongue and gradually forget about Putonghua,” he said. The spread of popular culture through mass media might have contributed to the loss of interest among young ethnic minorities in learning their traditional language and culture, said Wang Feng, a researcher at the institute of ethnology and anthropology, Chinese Academy of Social Sciences. The process of urbanization not only takes the young people away from their farmland but also their native languages and cultures, Wang told the Global Times. But a major challenge is public perception. Many people believe that it is not useful to learn their mother tongue and that learning Putonghua or foreign languages could guarantee their kids a better future. This is not an uncommon perception among parents, as educators and scholars found out when they launched the bilingual projects. “Most people assume that you can only do one language at a time and learning their mother tongue would be too much burden for the kids and take away time from learning Putonghua,” said Slater. Local project managers say that most parents changed their mind after seeing that their children seem to be doing better in school and genuinely enjoy learning. Founded in 1934, SIL has a presence in many countries around the world and controversy surrounds their work. It describes itself on its website as focusing primarily on “language development work [and] does not engage in proselytism, establish churches or publish Scriptures.” But it also “facilitates the translation of Scripture” when circumstances allow. SIL’s principal founder, missionary William Cameron Townsend, was also the founder of Wycliffe Bible Translators, an organization dedicated to translating the Bible into other languages all over the world. Wycliffe envisions a translation program for every language by 2025. Some linguists have criticized such activities by SIL/Wycliffe for changing and consequently destroying local ethnic cultures. For instance, SIL is still doing Bible translation in Brazil and has effectively converted most of the Nadëb people of Brazil into evangelical Christianity, said Patience Epps, an associate professor of linguistics at the University of Texas at Austin, critical of SIL’s missionary activities. Slater is candid about the nature of SIL. He says a major part of their job is translating the Bible, but they would not do it without consent. He also defends their position by saying that cultures are constantly changing and local communities can choose for themselves. Discussions or conversations about faith and religion probably would come up on an individual basis because if asked, staff would not hide the fact that they are Christians, said Slater, but they would not proselytize it in a school setting. Local partners said they have not noticed any missionary activities on the part of SIL and that their agreements with SIL have specifically prohibited such activities. Controversial or not, SIL seems to be welcomed by local partners. The bilingual projects are now completely locally run, while SIL provides the money and teaching materials. SIL is also involved in adult literacy programs and helps build schools in ethnic minority areas. Such bilingual education to protect minority languages depends largely on the willingness and investment of the authorities. Before SIL came in, local authorities had a three-year bilingual teaching project in Jianchuan between 1990 and 1993, said Wang. Bai students were taught in their mother tongue until the third grade. This stopped because of a lack of support. Both SIL and its local partners are eager to continue the cooperation after the Dai project ended last year in Jinghong, but bureaucracy seems to be holding up the progress. Slater said their role is to provide a model for bilingual education but it would depend a lot on the willingness of local partners to continue such efforts. The character 玩 has two pronunciations. [ㄨㄢˊ] means to play. [ㄨㄢˋ] means to joke. Here is the stroke order animation. Here are the individual strokes for writing the character. Here is the evolution of 玩. Lets learn numbers in Chinese with 1 and 0 in right up to a trillion thanks to thinking about languages. One thing that can be confusing is the names of numbers in Chinese. It is not simple to translate one to the other, especially for numbers above one hundred. In English, the name change occurs at the thousand. For example, a million is equivalent to a thousand thousand. In Chinese, the name change is at 萬, which is ten thousand, so the names do not change at the same numbers. 一億 is equivalent to 一萬萬. I do not know if this makes a difference in the perception of numbers. Does 十萬 seem larger or smaller than one hundred thousand? I’m not sure. If I write down the number, I know the two terms are identical. The character 父[ㄈㄨˋ] means father. This is the stroke order animation and pronunciation. These are the individual strokes for writing the character. Take a look at the evolution of 父.
I love the peace and tranquility of early mornings particularly on the beach. Here are the Chinese Characters and stroke order animation. 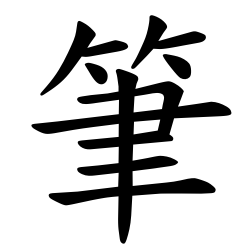 The character 清[ㄑㄧㄥ] means pure and clear. Here is the stroke order animation and pronunciation. Here are the individual strokes for writing the character. Here is the evolution of 清.